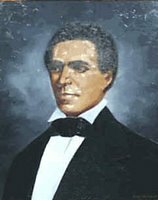 John Brown Russwurm (1799-1851) was an African American abolitionist from Jamaica. He is known for his newspaper, Freedom's Journal. He moved from the United States to Liberia to govern the Maryland section of an African American colony there. He died in Liberia in 1851. John Russwurm was born in 1799 in Port Antonio, Jamaica. Russwurm's mother was a slave, whose identity is presently unknown. His father was a white merchant. The Russwurm family stayed in Jamaica until he was 8, when the family moved to Quebec. That year, his father sent him to a formal school located in Quebec. This move meant that the family had to get used to a whole separate way of life. Soon after the move to Quebec, Russwurm's father married Susan Blanchard. After their marriage, the family, along with Blanchard, moved to Portland, Maine. Russwurm is noted as saying that moving constantly was the worst thing that happened in his life. After the family's relocation Russwurm attended Hebron Academy. Throughout the years Russwurm spent there, he worked long and hard to accomplish his goal of acquiring a good education. Russwurm was always in school and never got into any sort of trouble; his classmates nicknamed him "Honest John". Russwurm attended Hebron Academy for most of his schooling years. About a year before graduation, he moved to a new school, Bowdoin College, and graduated in 1826. He became the second African American to graduate from a United States College or University. After graduating from college, he moved to New York. There, he began to take a great interest in abolitionism. He worked until his death to abolish slavery. From reading anti-slavery newspapers, he became interested in journalism. Russwurm liked the way people expressed themselves to the community, but he didn't know how far his journalism interest would take him in life. Soon, he got an idea. He decided to create his own abolitionist newspaper. The name of the paper was Freedom's Journal. Among all of his writers, he himself had the most articles published. Russwurm always took his time on his articles; to make them as full and lengthy as possible. His paper was the only one in circulation run entirely by African Americans. Of all the abolitionist newspapers, Freedom's Journal was named the most successful. Due to such a high demand, Russwurm and his crew of writers worked late and hard to ship the newspapers all over the United States of America. The newspaper came to an end when John Russwurm gave up on the cause of abolitionism. He came to the conclusion that African Americans would never gain full rights in America. He gradually came to a close on his anti-slavery speeches, and moved to Liberia. John got a job offer in 1829 for a post in the organization for Pan-Africanism, at the colony of Liberia (a colony set up in Africa for freed slaves). The first place that he arrived at was Monrovia, Liberia. He stayed there for a while to get used to the foreign culture. The next challenge was to learn the language of Africa; to learn to live in Africa. The first thing that John Russwurm did when he arrived in Monrovia was to tackle the African language. Russwurm applied into an African language school and was accepted. He spent one school year learning every one of the languages available. After his language school, he immediately went to work at his post. Russwurm's new post was located in the Maryland section of the colony. During the beginning of his time, in addition to the Pan-Africanism organization job, he became editor for the Liberia paper, the Liberia Herald. John Brown Russwurm fell in love with Sarah McGill, the daughter of the colony’s lieutenant. They were together starting in 1833. Soon after, Sarah McGill became Sarah Russwurm. The couple had three sons and a daughter. They were together until death. Russwurm was made governor of the Maryland section of Liberia. This section was located in Cape Palmas, Liberia. Russwurm took the position seriously. He tried to make friendly relations with everyone including other nations. Another main goal of Russwurm was to get other African Americans over to the colony. Russwurm pushed and stayed strong during his time on post. In 1851, John Russwurm died while still on post. There is a statue of John Russwurm at his burial site at Harper, Cape Palmas, Liberia. I'm pretty pleased to find this website. I wanted to thank you for ones time for this particularly wonderful read!! I definitely loved every little bit of it and i also have you book marked to check out new stuff in your web site. i came to go back the prefer?.I'm attempting to in finding things to enhance my web site!I suppose its good enough to use a few of your ideas!! I loved as much as you'll receive carried out right here. The sketch is tasteful, your authored subject matter stylish. nonetheless, you command get bought an edginess over that you wish be delivering the following. unwell unquestionably come further formerly again as exactly the same nearly a lot often inside case you shield this hike. I'd really like to be a part of online community where I can get suggestions from other knowledgeable people that share the same interest. If you have any suggestions, please let me know. Cheers! Hey! I simply noticed another message in one other blog that regarded like this. How are you aware all this stuff? That’s one cool post. weblog consists of amazing and in fact excellent information for visitors. particulaг safety of one's personal data.